Typhoon & Transfer – Busy Week in the Philippines! This is just a quick post to let you know that I am safe and sound after Typhoon Glenda blew through Calamba. It’s been crazy, but in addition to the typhoon I got transferred, so I’m not anywhere to close to Hunter anymore. I am in the the town of Siniloan which is still in the Laguna Province but on the East side of Laguna de Bay. I have been called to be a zone leader, which means I am responsible for about 24 other missionaries in this area. My new companion is a big Tongan from New Zealand and he’s super funny and nice. I will be bale to post more on Monday, which is our P-Day, but our mission president said we could send a quick email to let everyone know that we are safe and have power and services back after the storm. Being called to serve as a zone leader freaked me the heck out at first, but it’s going pretty well and it’s helping me so much to become more like Christ. The storm was INTENSE! I watched a roof get ripped off around 4 am, but it wasn’t ours so that was good. At one point through the night I was getting rained on inside of my apartment through the windows and the air conditioning unit, so I got up and walked out into the living area and water was pouring through the back window! It was freaking loud as heck… so yeah it was flippin’ scary. But, alas I am yet alive and well in a new zone with some of the members of my MTC district back in Utah, so that is fun to re-connect with them and do good work. 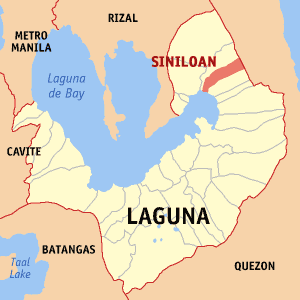 Location of Siniloan in the Laguna Province. I’ll write more in a few days and hopefully send photos of my new area.